Escape the busy lifestyle and stress by treating yourself to some well needed “me” time. This Kids Teacher Training is set in the picturesque south of India, perfect to de-stress, detox and dive into a Yoga teacher training course. Envision saluting the sun, unwinding with an ayurvedic massage, relaxing on the Kerala backwaters and indulging in freshly sourced meals. You have 4 days to fully surrender to nourishing your soul and connect with your mind and body. You will return home with an International Yoga Alliance Certificate feeling rebalanced and inspired. Hi, I am Cayetana Rodenas, the one who hosts the retreat. Hope you enjoy. Welcome to Southern India. The land of palm trees, fresh coconuts, nutritious meals, yoga and relaxation. Put your bags down and feet up as we prepare and upskill you for the next 8 days. Group dinner and overnight stay in Kochi. Morning yoga followed by Breakfast. Get ready to hit the streets of Kochi. Walking tour with our guide, visiting The Chinese Fishing Nets, St. Francis Church with the first tomb of Vasco de Gama, Paradeshi Jewish Synagogue of Cochin, Jewish town and Dutch Palace. We will stop for lunch along the way and later head back to our hotel for group dinner and relaxation. Morning Yoga, followed by breakfast. Today we leave Kochi and drive 140 kms South to Kollam, onroute we will stop in the famous town of Alleppey to enjoy cruising on the Kerala backwaters; Lunch included. Later that afternoon we will check-in to our resort in Kollam, unwind by the pool. Group dinner and relaxation. Let's bring our hearts together for day one of our Teacher training course. Learn, expand and grow. Enjoy an evening together with yogic dinner and study by the pool or in the garden. As the sun rises, as do we! Day two of our Teacher training course will commence. Our evening will be complete with a walking tour of the local villages to see the traditional way of life in Kerala, a sunset cruise and group dinner. As our mind starts to open, our body will follow. Lakeside morning yoga with the nature around us, today is the final day of our Teacher training course. Let the celebrations begin with a graduation group and local dance performance. Take a rest this morning, sleepin and enjoy a group breakfast. Today we leave Kollam and take a drive South, we will stop for chai in Varkala, and later we check-in to Kovalam Resort. During the afternoon we will hit the famous beaches and shops and enjoy our last meal together. Only when something ends, there is space for new beginnings. Bon appetite - A morning of delicious foods to complete our journey together. Depart for your next destination with the high spirits of Southern India. I was born and raised in Madrid, Spain. Since a very young age I got involved in different Performing Arts; I studied Drama, Song and Dance and became a very important part of my life. I also studied Education and worked as a Drama & Dance Teacher for several years. Later on, Yoga came into my life by a beautiful chance, when I was living in Australia. I completed my YogaTeacher Training there and soon after started working as a Yoga Teacher. After that, I completed my Kids Yoga Teacher Training with Marsha Wenig and The Radiant Child Yoga Program with Shakta Kaur Khalsa. 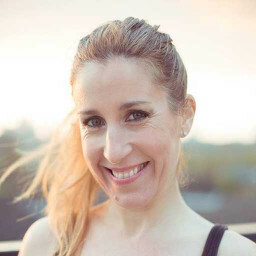 I also owned my own Yoga Studio in Madrid called YOGA&ARTE for almost a decade, where I was teaching Hatha, Vinyasa and Dynamic styles of Yoga, as well as Yoga for Kids, Pregnancy Yoga and Mom&Baby Yoga. I starred in a TV program in Spain, introducing the Yoga section and I am currently in the process of completing another project for Spanish TV that will be broadcasted soon! I am also the creator of a Teacher Training program for school teachers, so they can teach Yoga in schools and share the benefits and joy of Yoga among many children all over the world. Nowadays I spend my days travelling around the world teaching this training.